Once you’re a patient, it’s inevitable that you lose some control over your life. The illness or condition that made you a patient dictates much of what’s to come – how you’re going to feel, the healthcare professionals you see, the treatment you receive, and your outcome. It can be overwhelming and tempting to let those with medical expertise take over and guide you through the process. However, just as we’re told “consumer beware” when buying something or hiring a service, “patient safety awareness” is something people should keep in mind when receiving medical care. And just because we lose some control to our illness, it doesn’t mean we have to lose all control. March 10 to 19, 2019, is Patient Safety Awareness Week. The week was established to help the public recognize the need to understand the different aspects of their health care and safety and help reduce mistakes. Healthcare providers are human and humans make mistakes. Good training and good practice reduce the risks of errors, but they still can happen. “Always remember that physicians are human beings, just like you,” says Steven Q. Simpson, MD, Professor of Medicine and Acting Director of the Division of Pulmonary and Critical Care Medicine at the University of Kansas, and Chief Medical Officer of Sepsis Alliance. “Their brains are subject to making mistakes because of lack of sleep, disagreements with their spouse, and worries about their children, just like yours.” Most mistakes do little, if any, harm. But sadly, some mistakes can and do cause serious complications, even death. 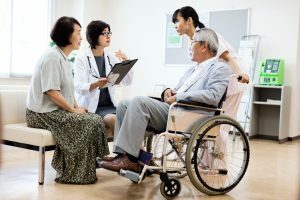 According to the Institute for Healthcare Improvement (IHI), some studies suggest that there are up to 400,000 error-related deaths in the healthcare system. What are medical or healthcare mistakes? They can range from misdiagnosis to someone giving the wrong medication or treatment. It also means contracting an infection in a health setting (clinic, office, hospital). These are called healthcare-acquired infections or HAIs. Latest numbers suggest that as many as one in every 31 patients in hospital develop an infection while there. There are several types of infections that can spread in the healthcare setting, but the most common ones are Methicillin-resistant Staphylococcus aureus, commonly referred to as MRSA, and Clostridium difficile, often called C. difficile or C. diff. The Agency for Healthcare Research and Quality (AHRQ) says one way to reduce your risk of contracting an infection, which could lead to sepsis, is by asking all healthcare workers who touch you if they have washed their hands. People providing direct patient care should wash their hands before and after touching each patient. Spread of virus or bacteria through touch is a common route for infection transmission. The AHRQ site has this recommendation and more to help patients understand and decrease their risks of errors in a fact sheet: 20 Tips To Help Prevent Medical Errors. If you aren’t sure about something or you feel there is something not quite right, you must speak up to prevent errors. “Always ask questions,” says Dr. Simpson. “Never assume that everything is the way it should be, if something doesn’t feel right. Ask your loved ones to do the same, because you won’t always be well enough to think clearly. Never, never, never hesitate to correct a doctor or nurse if you KNOW that they are making a mistake. For example, giving you a medicine that hasn’t been discussed with you, marking the wrong arm for surgery, describing someone else’s illness when they are talking to you, about to perform a procedure that you don’t remember giving consent for.” Speaking up helps both you and the staff, because preventing medical errors is the end goal. Please visit the Sepsis and… library to learn more about sepsis and healthcare-acquired infections and how you may help protect yourself. Next Next post: Connie B.